From the fiery kimchi of Korea to American dill spears; from the spicy achar of India to the ceviche of Latin America; from Europe’s sauerkraut to brined herrings and chutneys, pickles are unquestionably a global food. Across continents and throughout history, humans have relied upon pickling to preserve foods and add to their flavor. Both a cherished food of the elite and a staple of the masses, pickles have also acquired new significance in our health-conscious times: traditionally fermented pickles are probiotic and said to possess anti-aging and anti-cancer properties, while pickle juice is believed to prevent muscle cramps in athletes and reduce sugar spikes in diabetics. Nota bene: It also cures hangovers. In Pickles, Jan Davison explores the cultural and gastronomic importance of pickles from the earliest civilizations’ brine-makers to twenty-first-century dilettantes of dill. Join Davison and discover the art of pickling as mastered by the ancient Chinese; find out how Korean astronaut Ko San took pickled cabbage into space in 2008; learn how the Japanese pickle the deadly puffer fish; and uncover the pickling provenance of that most popular of condiments, tomato ketchup. 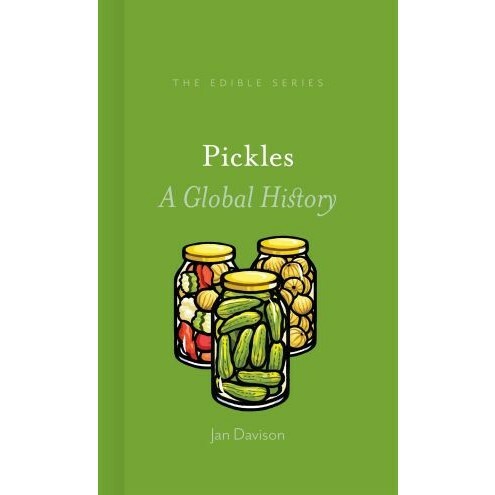 A compulsively consumable, globe-trotting tour sure to make you pucker, Davison’s book shows us how pickles have been omnipresent in humanity’s common quest not only to preserve foods, but to create them—with relish. Jan Davison lives and works in London. Her first book, English Sausages (2015), explored the little-known culinary history of England's sausages and puddings.